A skilfully blended aromatic preparation of gentian in combination with a variety of vegetable colouring matter. Made with the same ingredients since 1824. 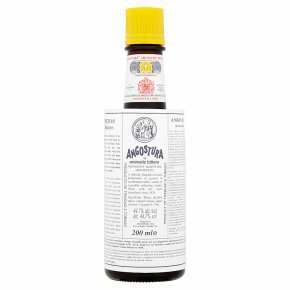 Angostura aromatic bitters was first made in 1824 by Dr. J.G.B. Siegert in the town of Angostura, Venezuela. Angostura aromatic bitters may be distinguished from all other aromatic bitters by its fine flavour and aromatic odour. At the principal International Exhibitions it has received the highest recognition. Because of its delightful flavour and aroma it has become extremely popular for use in soft drinks, cocktails and other alcoholic beverages. It also imparts an exquisite flavour to soups, salads, vegetables, gravies, fish, meat, fruit-juices, grapefruit, mixed cut-fruits, stewed prunes, stewed figs, preserved fruits, jellies, sherbets, water-ices, ice-cream, sauces for puddings, hard sauces, plum pudding, mince and fruit pies, apple sauce and all similar desserts, regulating the quantity according to taste.